Like any worthwhile endeavor, the design and construction of an inground concrete swimming pool come with its own set of vocabulary words. That’s why it’s helpful to bone up on some of the lingo before your first appointment with a contractor. While experienced pool professionals will talk you through the construction process step-by-step and explain technical terms, it’s still smart to become familiar with some basic ones ahead of time. Getting a leg up on the lingo will make you more informed, which will help you have a more productive meeting with your designer. In turn, that leads to good communication that helps drive the ultimate result: your ideal backyard resort! 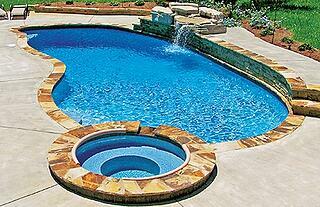 Now, every inground pool project is different. However, virtually all custom builds involve certain structural and material features. Let’s take a look at five key terms crucial to all standard pool-construction plans. Rebar is shorthand for steel reinforcement bars. Builders sometimes refer to these long, rounded bars as “the steel.” The bars come in a variety of grades, each with specified purposes for use in construction applications. Used in concrete structures from bridges to skyscrapers to provide additional strength to concrete, rebar has also been used for decades for building pools. 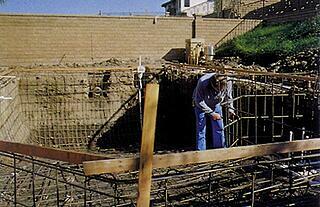 Rebar increases the tensile strength—the ability to withstand pressure—of the concrete pool shell. On its own, concrete is a highly durable, lasting building material. Introduce the component of steel for added fortification, and you have a dynamic power duo that delivers a tough, resilient pool structure for decades to come. After the hole for a new pool has been excavated, it’s time to add the rebar. A team of steel installers carefully bend hundreds of pieces of rebar into the outline of the pool shape per the construction plan, as seen here. As each section of rebar gets placed into the larger network, tradesmen use steel ties to permanently fix each bar into place. Using bricks, blocks of wood, or plastic spacers, installers will position the strategically placed network of steel a few inches above the ground and out from the dirt walls. Preserving these few inches of space between the steel and the soil throughout the excavated hole serves a purpose. When concrete is applied, this space allows room for the concrete to flow not only over the steel, but underneath and behind it. Paired with the rebar, the concrete becomes the vital, enduring body of the swimming pool. In laying down this steel network throughout the pool, extra rebar will be laid at certain points to provide even greater fortification. These include sections of the pool that are subject to high stress, such as the deep end or any raised “bond beam,” (a term explained below). You know about concrete and the many structures for which it’s used. Well, your new pool will use this proven material as well. The special form of concrete used in pool construction comes in two versions, and each blend contains several other materials, discussed below. What’s unique about concrete for pools is both the blend and how it is applied pneumatically into the pool form. That means it’s pumped and shot on using a high-pressure hose, as seen here. 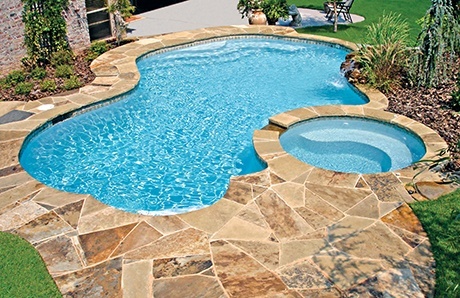 Typically, when it comes to conversations about pool construction, the term “gunite” is used. 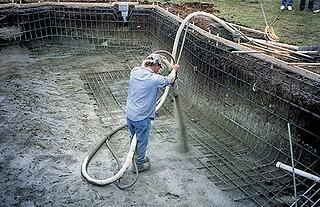 However, there are two blends of concrete are used in the pool industry: Gunite and shotcrete. Both forms deliver the rock-hard foundation of the long-lasting vessel that forms an inground pool. Both deliver enormous options for versatility of shape, configuration, integration of a custom spa, and other design elements. First, let’s define shotcrete. It’s a mixture of sand, cement, and pea-gravel aggregate. Water gets added to it. The blend is prepared in a production facility, and the wet material is poured into a ready-mix truck—one of those big flatbed vehicles you see with a massive, rotating barrel on it. The continuous movement keeps the material soft and pliable until it arrives at the job site for application. Gunite is very similar to shotcrete; in fact, gunite is actually a type of shotcrete. Sometimes, it’s referred to as “dry mix” or “dry shotcrete.” It’s a dry blend of sand and cement. This mix, while still dry, gets loaded into a truck and brought out to the pool site. The material is pumped through a hose with an applicator nozzle head. The nozzle has an attachment that adds water to the material as it leaves the nozzle. Does it matter which form of concrete your pool builder uses? Between the two, one’s not better than the other. It’s more a matter of which one is prevalent where you live. Typically, it depends on which of the two that specialty contractors are using in the local area. At the end of the day, it comes down to hiring a quality pool builder who will use expert tradesman to shoot quality concrete—whether gunite or shotcrete—to ensure the beauty and structural integrity of your pool. The interior finish that goes on your pool & spa is a major player for the final aesthetic. After all, the interior surface area—along with the pool’s water above it—is what you will see every time you look at your backyard resort. Often referred to as “plaster,” the material is applied throughout the entire interior of your pool & spa over the rough, porous concrete shell to provide a visually pleasing appearance. But plaster also has a highly utilitarian purpose: It’s what does the vital job of making the interior of your pool smooth and—more critically—waterproof. Concrete pools typically get plastered with one of three major types of interior finish: Marcite, quartz aggregate, or pebble. All three are prepared at the job site, and crews who specialize in their application will carefully trowel on smooth layers of the material throughout the pool & spa interior, as pictured here. 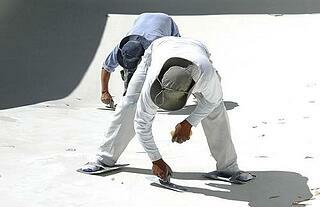 For decades, the most widely used material for pool finishes has been plaster. This term is often used generically to refer to pool finishes and to the final construction phase of “plastering the pool.” Specifically, though, plaster refers to marcite. It’s a mixture of white cement and finely ground marble—also known as marble dust. Marcite covers the interiors of thousands of pools across the globe. Based on the initial cost, plain white or colored marcite is the most affordable option for a new pool or re-plaster of an existing one. However, there’s a new trend. Increasingly pool buyers—as well as pool owners updating their interior finish—are moving away from marcite. The reason why is that it’s vulnerable to problems, such as stains, etching, and discolorations, and any blemishes are easily seen. A step up from marcite is quartz aggregate. The blend includes small rounded granules produced from natural quartz. Using ceramics, colored pigments are permanently bonded onto the surface of the pieces. The resulting color quartz aggregate is mixed with plain marcite, and pool plastering crews will apply the blend just like traditional marcite. Quartz finishes have become popular across the country because they provides several advantages. One is that it creates a lovely, colored, speckled pattern with greater visual dimension. The range of colors choices is extensive as well. Another benefit is strength. Quartz resists chipping and etching, and it does a better job than plain marcite of fending off erosion caused by pool-water chemical imbalances. For any flaws or deterioration that eventually may come with age, a quartz finish does a great job disguising them; any blemishes tend to blend into the speckled, multi-dimensional background. With its aesthetic and durability benefits, this distinctive pool finish is becoming a favorite option over old-school marcite. While quartz may cost more upfront, it provides greater value over time since it will look better and last longer. At the top tier of the plaster-material choices is a pebble finish. With its blend of small pebbles in various color blends, this kind of finish delivers a stunning aesthetic to any pool. 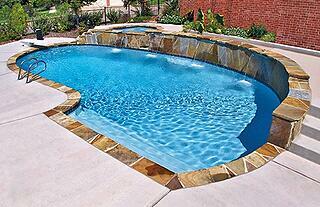 Along with its great beauty, pebble blends are highly durable and will almost always outlast other pool finishes. While they provide great value for both aesthetic and performance, they also come with a high purchase price and are usually a luxury upgrade best-suited for generously sized pool budgets. The bond beam is the very top, horizontal element along the perimeter of an inground pool. Typically, it’s about 12 inches wide and reinforced with extra steel rebar, because the top sections of a pool require extra support. The additional strength that reinforced bond beams provide helps maintain the integrity of the pool walls and extends the life of your pool. In many pool designs, a taller version of a bond beam is included. Certain sections of the beam are raised, forming walls that extend above the pool’s water surface. Typically, they rise six inches to three feet, although they can go much higher on some projects. There are a few reasons, both functional and aesthetic, to include a raised bond beam in a pool design. One is to address backyard topography. For example, if your backyard contains slopes or hills, a retaining wall may be needed to keep soil from sliding or washing (from rain or melting snow) into the pool situated below. Depending on the configuration of your yard and the proximity of the pool to the location for the wall, a pool builder may suggest incorporating the retaining wall into the pool structure itself. In other words, the wall does double duty to retain soil but also forms one side of the pool. In most cases, a retaining wall is not needed. However, other settings lend themselves to raised beam. One is a sloped yard. In this case, one portion of the deck may be on higher ground than the rest of the deck, and one side of the pool may need to extend upward to integrate the pool into a two- or three-level deck. A raised wall along the pool offers superb opportunities for decorative features and a more dramatic design, as illustrated in the example below. Keep in mind, that even in a flat yard you can incorporate a moderately raised bond beam to take advantage of the design avenues it offers. Regardless of the reason for including a raised beam in the first place, the swath of wall rising above the water surface provides a canvas for adding style and dimension. You can cover it in a variety of coordinating or contrasting tile or stone, add sconces, cascade water features, or other innovative accents that your builder suggests. You may or may not have ever heard the term “coping,” but it’s an important element of pool design and construction. Coping is the material installed along the perimeter of your pool, defining its shape and separating the decking from the pool structure itself. Typically, it runs 12 to 18 inches in width. This decorative element comes in a variety of materials, including brick, natural stone like flagstone or travertine, and colored concrete pavers. From a design perspective, the shape of your pool can be smartly outlined with the right choice of material that sets it off from the deck. Now, if you choose a coping material that contrasts with that big gray expanse—perhaps a reddish brick or tan-brown flagstone—you get a nice visual delineation. When you look at the pool from a distance, as illustrated in the example below, the distinct shape of the pool visually pops. On another front, coping is installed for functional reasons as well. 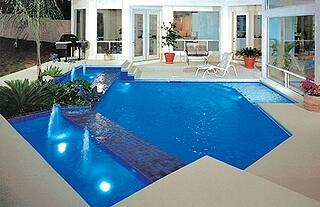 One is to ensure the integrity of your pool deck. In many regions of the country, the ground shifts, expands, and contracts to some degree due to changes in moisture, temperature, and seismic activity. The soil in some regions is not affected a great deal by these natural changes. But in areas with expansive soil that sops up moistures and essentially “grows,” trouble can develop. Shifting ground can cause decks to heave up in spots or sag in others. For this reason, coping around a pool limits opportunities for any deck issues to impact the pool structure. Here’s how: Coping allows the deck to become completely independent and separated from the pool shell. Instead of the walls of the pool being immediately adjacent to and touching the edge of the deck, the two structures never meet. The earth around each structure can expand and contract on its own without impacting the other. Coping plays a hand in swimmer comfort and safety as well. When installed on the pool, pieces of coping cantilever slightly—or extend past—the pool perimeter into the space above the pool tile line. That makes coping easier to grip; it serves as a continuous handhold around most or all of the pool perimeter. Anyone swimming can reach for the coping and hold onto it. Bonus vocabulary word: Mastic. In some regions of the country where shifting soil can wreak havoc on decks, this liquid compound is applied into the space between the coping and deck. Once it dries, mastic assumes a rubber consistency and creates a water-tight seal. This barrier prevents water from running down into the space and causing the ground below to become saturated and to swell—which can lead to deck damage. Keep in mind that in a few areas of the country in certain backyards blessed with highly stable soil, pools can be built without any coping. Highly stable ground allows for what’s known as a cantilevered deck. No coping separates the deck from the pool, and the deck juts out slightly over the pool, as shown in this custom pool. Designing and building a new backyard resort can be almost as much fun as using it. It will also be a learning process. You can look forward to acquiring a great deal of information about design and construction. From design features to pool-building materials, expect to expand your grasp of many new terms and concepts. The lingo outlined here will get you started on the right foot—and help you avoid any unnecessary Mr. Mom-type moments.